Palmerston North (/ˈpɑːmərstən/; Māori: Te Papa-i-Oea) is a city in the North Island of New Zealand and the seat of the Manawatu-Wanganui region. Located in the eastern Manawatu Plains, the city is near the north bank of the Manawatu River, 35 km (22 mi) from the river's mouth, and 12 km (7 mi) from the end of the Manawatu Gorge, about 140 km (87 mi) north of the capital, Wellington. Palmerston North is the country's seventh-largest city and eighth-largest urban area, with an urban population of 86,600 (June 2018). The official limits of the city take in rural areas to the south, north-east, north-west and west of the main urban area, extending to the Tararua Ranges; including the town of Ashhurst at the mouth of the Manawatu Gorge, the villages of Bunnythorpe and Longburn in the north and west respectively. The city covers a land area of 395 square kilometres (98,000 acres). The city's location was once little more than a clearing in a forest and occupied by small communities of Māori, who called it Papa-i-Oea, believed to mean "How beautiful it is". In the mid-19th century, it was discovered and settled by Europeans—originally by Scandinavians and, later, British colonists. On foundation, the British settlement was bestowed the name Palmerston, in honour of Viscount Palmerston, a former British Prime Minister. The suffix North was added in 1871 to distinguish the settlement from Palmerston in the South Island. Today, the name is often informally shortened to "Palmy". Early Palmerston North relied on public works and sawmilling. The west coast railway was built in 1886, linking the town to Wellington, and Palmerston North benefited from a booming pastoral farming industry. Linton Military Camp, Palmerston North Hospital, and the establishment of Massey University (in 1927) have reduced the dependence on farming since the early 20th century. Popular attractions include Te Manawa (a museum and art gallery that includes the New Zealand Rugby Museum within its building), and several performing arts venues. Ngāti Rangitāne were the local Māori iwi (tangata whenua) living in the area known as Te Ahu-ā-Tūranga, when a trader, Jack Duff, became the earliest known European to explore the area c. 1830. He came on a whaling ship and explored possibly as far inland as the site of Woodville. He reported his discovery on arrival back to Porirua. Colonel Wakefield heard of the potential that the Manawatu had for development and visited in 1840. In 1846 Charles Hartley, another trader, heard from tangata whenua of a clearing in the Papaioea forest and he proceeded through the dense bush and forest and discovered it for Europeans. In 1858, the Government began negotiations with local iwi to purchase land in Manawatu. There was a dispute at the time between rival iwi Ngāti Rangitāne and Ngāti Raukawa as to who has the right to sell. The dispute is resolved in favour of Rangitāne. On a visit in 1859, John Tiffin Stewart, an employee of the Wellington Provincial Council, was shown the Papaioea clearing by Rangitāne chief, Te Hirawanu, and noted its suitability for a "good site for a township". In 1864, Te Ahu-a-Turanga Block was sold by Rangitāne to the Government for £12,000, in an effort to open the Manawatu to settlement. Later the same year, the suffix North was added to distinguish the settlement of the same name in Otago. In 1872 a petition was launched to change the name of the settlement. A public meeting in 1873 ends with no clear decision on the name. The railway line was laid through the Square in 1875. The foundation stone for the original All Saints Church was laid by Louisa Snelson on 29 September 1875. By 1875 there were newspapers, a doctor and a post office. In 1876, Palmerston North became a Local Board District, within the Wellington Provincial Council. This existed until the abolition of the provinces later the same year. Also in the same year, the council set aside land north of the Manawatu River for the purposes of a reserve. In 1890, this land was again set aside and would become in 1897, the Victoria Esplanade. View of the (Chief) Post Office in Palmerston North, (opened in 1906) with the business premises of G H Bennett (booksellers, stationers & newsagents) behind a hedge centre left. There are a number of people, and horses & carriages outside the post office. Photograph taken by William A Price. In 1893, Rangitāne sold the Hokowhitu block, increasing the area of land available for settlement. In the same year, the Public Hospital opened in a wooden building on Terrace Street (now Ruahine Street). The hospital required significant fundraising. At the end of the decade, the Boer War broke out in South Africa and men from Palmerston North were among the volunteers. By 1900 the population had reached 6,000. In the 1910s Palmerston North's growth was steady. The population in 1911 about 10,991 (excluding Māori). The city was affected by World War I, with Awapuni Racecourse being used as an army training camp in 1914. During the course of the war, the Borough Council renamed all German-sounding and foreign street names. When the war finished in 1918, celebrations were delayed due to the Influenza epidemic. In 1930, the population reached the 20,000 threshold and Palmerston North was officially proclaimed a city, the 7th in New Zealand. Development was slow due to the great depression and World War II. An airport was established at Milson in 1936, which is now Palmerston North Airport. From 1938, the first Labour government (1935–1949) initiated state housing programmes in West End (Savage Crescent precinct) and Roslyn. In 1941, the Manawatu River flooded again, having last flooded in 1902. Large parts of Hokowhitu and Awapuni were underwater, with residents evacuating to higher ground (peaked at 5.8m). In 1940 the Māori Battalion was formed in Palmerston North and trained at the Showgrounds (now Arena Manawatu). In 1942, Linton Army Camp was established. After the war, the city's growth was rapid. By 1950, the city's boundaries had extended to include Milson and Kelvin Grove. In 1953, the boundaries would further extend to include Awapuni, which in the same year, was again flooded by the Manawatu River, along with Hokowhitu. It was the largest flood since 1902. Although work had started in 1926, it was not until 1959 the Milson Deviation of the North Island Main Trunk was opened. This meant future trains would pass to the north of the city, instead of through the Square. Later in 1963, the railway station at Tremaine Avenue opens. The last trains passed through the Square in 1964. In 1961, the Highbury was added to the council area. In 1963, Massey University College of Manawatu was formed by the amalgamation of the Massey Agricultural College with the Palmerston North University College. In 1964, it becomes Massey University, an autonomous tertiary learning institution with the power to grant its own degrees. In 1967, city boundaries were again extended to include land in Aokautere, Kelvin Grove, Milson, Amberley (Westbrook) and Awapuni as part of future growth for the next 25 years. In 1970, the New Zealand Rugby Museum was established and a tribute to the founding father of rugby in New Zealand, Charles Munro, was opened at Massey University. In 1971, a competition to design a civic building for the vacant railway land at the Square, is won by Wellington architects, Maurice and John Patience. The resulting building was finished in 1979. In 1976, the Manawatu and Oroua rivers flood, 24-hour rainfall records in Feilding and Palmerston North are exceeded and some residents from both locations are evacuated. Although the land Palmerston North is situated on is bounded by the lofty Ruahine and Tararua ranges in the east and south respectively, the city has a predominantly flat appearance. The occasional rise in elevation occurs further away from the river and is especially pronounced in the north and northeast, and also on the south side of the river. The typical urban area elevation ranges between 20–40 metres (65–130 ft) above sea level. The highest point is 760 metres (2,493 ft) above sea level. This is in the Tararua ranges, south-east of Scotts Road. The lowest Point is 10 metres (33 ft) above sea level. This is at the river bank near Te Puna Road. Incidentally, both these locations are in the south-west of the city, by Linton. There are 5.54 square kilometres (1,369 acres) dedicated to public reserves. The length of the Manawatu river within the city boundary is 29.9 kilometres (18.6 mi) and its tributary at Ashhurst, the Pohangina, is 2.6 kilometres (1.6 mi). Close to the city is the largest electricity-generating series of wind farms in the southern hemisphere, with 286 turbines in the Tararua and Ruahine Ranges providing power for approximately 50,000 homes. Palmerston North is governed by a city council which consists of a mayor and 15 councillors. Previously for representation purposes, the city was divided into five wards (previously 6, however, 2 wards amalgamated). In April 2013, the Local Government Commission abolished the wards and therefore the city will elect its council on a citywide basis. Elections for Mayor and local government occur nationwide every three years, with the next election to take place in 2019. The 2013 election saw the Single Transferable Voting (STV) system introduced, replacing plurality voting (First past the post-FPP). The Chief Executive is Heather Shotter, who replaces Paddy Clifford. Palmerston North in the parliamentary term spanning 2014 to 2017, is represented by 3 electorate MPs and 2 List MPs in Parliament. The boundaries of the electorate of Palmerston North have changed often since the introduction of MMP. It has been previously larger than now and formerly extended over the Manawatu River into the southern suburbs. A 2007 redraw transferred the southern suburbs to Rangitīkei, in return for Kelvin Grove and Milson, making Palmerston North a completely urban electorate. Currently Palmerston North is surrounded by the Rangitīkei electorate. Since 2008, the Palmerston North electorate has been held by Iain Lees-Galloway of Labour. The large electorate of Rangitīkei extends south to Palmerston North's southern and eastern parts, the mostly rural former Ashhurst-Fitzherbert ward. Rangitīkei therefore completely surrounds the electorate of Palmerston North (the only electorate thus surrounded completely by another). The electorate was formerly represented (1998–2011) by Simon Power (National) and has been represented by former Manawatu District Mayor Ian McKelvie (National) since the New Zealand general election at the end of that year. One of the seven Māori electorates, Te Tai Hauāuru includes all of the Palmerston North area. The electorate is currently held by Adrian Rurawhe of the Labour Party. Darroch Ball of New Zealand First is a Palmerston North based list MP. The Palmerston North Police are responsible for law enforcement in the city area. The main Police Station is in the central business district, a short distance down the road from The Plaza. Community Police centres exist in Ashhurst, Highbury, Linton, and Massey University (Turitea). The NZDF Military Police work closely with the NZ Police conducting mobile and foot patrols, this is due to the serviceman that frequent the cities bars and clubs from Linton Military Camp and RNZAF Base Ohakea. 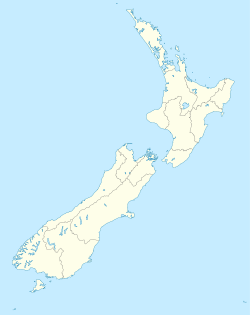 The Manawatu, Taranaki, Whanganui-Ruapehu Police District covers the Ruapehu District in the north, to Otaki in the south and includes Taranaki, Wanganui, Manawatu, Horowhenua and Tararua. The District's Headquarters are in Palmerston North. At the 2013 census, Palmerston North had a population of 80,079, an increase of 2,355 people (3.0%) since the 2006 census. There were 29,892 occupied dwellings, 1,914 unoccupied dwellings, and 99 dwellings under construction. Of the population, 38,391 (47.9%) were male and 41,688 (52.1%) female. The city had a median age of 33.8 years, 4.2 years below the national median age of 38.0 years. People aged 65 years and over made up 13.3% of the population, compared to 14.3% nationally, and people under 15 years made up 20.0% of the population, compared to 20.4% nationally. Due to Palmerston North being a university city, approximately 36% of the population is aged between 15.0 and 24.9 years. The median annual income of all people 15 years and over was $27,000, compared with $28,500 nationally. Of those, 39.9% earned under $20,000, compared with 38.2% nationally, while 24.1% earned over $50,000, compared to 26.7% nationally. Palmerston North City had an unemployment rate of 7.5% of people 15 years and over, compared to 7.1% nationally. At the 2013 Census of Population and Dwellings, 78.9 percent of Palmerston North residents identified as of European ethnicity, 16.5 percent as Māori, 9.7 percent as Asian, 4.5 percent as Pacific Peoples, 1.3 percent as Middle Eastern/Latin American/African, and 2.1 percent as another ethnicity (mainly 'New Zealander'). Around 19.2 percent of the Palmerston North's population was born overseas. Asia is the largest region of origin, accounting for 36.9 percent of the overseas-born population in the region. At the 2013 Census, around 48.9 percent of Palmerston North residents affiliate with Christianity and 5.4 percent affiliate with non-Christian religions, while 43.4 percent are irreligious. Anglicanism and Catholicism are the largest Christian denominations in Palmerston North with 12.1 percent and 12.0 percent or residents affiliating respectively. Hinduism (1.5 percent), Islam (1.3 percent), and Buddhism (1.3 percent) are the largest non-Christian religions. 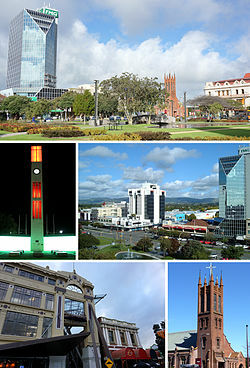 Palmerston North is a cathedral city, and the seat of the Roman Catholic Diocese of Palmerston North. The Cathedral of the Holy Spirit, Palmerston North is its cathedral. The Bishop of Palmerston North is Charles Drennan. In the Anglican Communion, Palmerston North is under the jurisdiction of the Diocese of Wellington, whose Bishop is Justin Duckworth. Palmerston North also is in the Anglican Hui Amorangi of (Te Pīhopatanga o) Te Ūpoko o Te Ika. The current Pīhopa is Rev. Muru Walters. There are also many other churches with denominations such as Adventist (Mosaic Community Church and Palmerston North Seventh Day Adventist Church), Apostolic, Assembly of God (AOG), Baptist, Brethren, Christian Scientist, Church of Christ, Church of Jesus Christ of Latter-day Saints, Jehovah's Witnesses, Lutheran, Methodist, Pentecostal, Presbyterian and Religious Society of Friends. There are Sikh gurdwara near the CBD and in Awapuni. Although Palmerston North has 1.9% of the population of New Zealand, 2.5% of the nation's employees work in the city. The important sectors are tertiary education, research and central government (Defence force). At the 2013 census, the largest employment industries for Palmerston North residents were health care and social assistance (4,686 people, 13.0%), education and training (4,473 people, 12.4%), retail trade (4,062 people, 11.2%), public administration and safety (3,636 people, 10.1%), and manufacturing (2,703 people, 7.5%). The tertiary education sector provides NZ$500 million a year to the local economy and the education sector accounted for 11.3% of the Palmerston North workforce in February 2006. Palmerston North has a long history of innovation in the business sector. A number of firms founded in or near the city have become nationally or internationally renowned. One of the largest and well known of these is GSK (GlaxoSmithKline). Glaxo had its beginnings in Bunnythorpe, now a part of Palmerston North. Palmerston North has a number of facilities and attractions. It is also the gateway to attractions in other parts of the region, such as Tongariro National Park, Ruahine and Tararua Ranges. When Palmerston North Airport serviced international flights, the city was also an international gateway to Hawke's Bay, Wanganui and Taranaki. The Plaza is the largest shopping centre in the Manawatu-Wanganui region and a key shopping centre in the lower North Island, boasting over 100 stores. It was built in about the 1980s and then upgraded again in around the late 2000s to what it is now. Palmerston North and its surroundings feature roughly 100 parks and reserves. Victoria Esplanade, located along the northern bank of the Manawatu River, west of Fitzherbert Avenue, include serene native bush surrounding family-friendly facilities, an aviary, a café, a duck pond, the Palmerston North Esplanade Scenic Railway featuring a 2.2 km track through native bush, the Peter Black Conservatory and walking tracks within the bush. The Dugald McKenzie Rose Garden is attached to the esplanade gardens. The Gardens were opened to commemorate the 60th Jubilee of Queen Victoria's reign (1897). A wildlife centre is set to be built here in the near future. Nearby the Esplanade is the multi-sport playing fields of Ongley and Manawaroa Parks, the twin turf hockey fields and Fitzherbert Park, the premier cricket ground. Elsewhere in the city are parks for sports like rugby, such as Coronation Park, Bill Brown Park and Colquhoun Park (also used for softball/baseball); and football: Skoglund Park (home of the Central Football Federation) and Celaeno Park. Memorial Park has a football pitch, and also has family-friendly facilities. The Hokowhitu Lagoon is also located nearby the Esplanade and is a popular site for recreational kayaking and canoeing. The Lido Aquatic Centre is Palmerston North's largest aquatic centre. It provides outdoor facilities including a family leisure pool, a 50 m pool for competitive swimming and a dive pool. Indoor facilities include a second family leisure pool, spa pool, heated pool, and cafe. Freyberg Community Pool is an all-year indoor swimming pool complex located next to Freyberg High School in Roslyn. Palmerston North has a main public library with five branches and one mobile library. The central Palmerston North Library is located in the Square and houses the main collections. The other four are located in Ashhurst, Awapuni, Linton, Roslyn and Te Pātikitiki (Highbury). Near the Square is the Youth Space, opened in September 2011 as a dedicated place for Palmerston North's many young people to congregate in a safe environment. Youth space is free to all, and provides table-tennis, gaming consoles, musical instruments, library books, iPads, a kitchen, and other services. Te Manawa is the cultural museum of art, science and history. Attached to Te Manawa is the New Zealand Rugby Museum. There are many small independent galleries. Many of New Zealand's best-known artists came from or live in Palmerston North. The list includes Rita Angus, John Bevan Ford, Shane Cotton, Paul Dibble, Pat Hanly, Brent Harris, Bob Jahnke, John Panting, Carl Sydow and Tim Wilson. Regent on Broadway Theatre is a 1393-seat multipurpose performing arts facility. Globe Theatre is a small community theatre of about 100 seats, built in about 1984. It is currently undergoing redevelopment, with the addition of another 100 seat auditorium. Top comics including John Clarke, Jon Bridges, Jeremy Corbett, Tom Scott all come from Palmerston North as do stage, television and film performers Paul Barrett, Shane Cortese, Kate Louise Elliott, Simon Ferry, Greg Johnson, Jeff Kingsford-Brown and Alison Quigan. Local groups include the Manawatu Sinfonia and Manawatu Youth Orchestra (MYO) who perform throughout the year. The Manawatu Youth Orchestra celebrated its 50th year in September 2011. The premier multi-sports venue in Palmerston North is Arena Manawatu (previously known as Palmerston North Showgrounds). For sponsorship purposes is known as Central Energy Trust Arena. The main stadium (Arena One) is the home of the Manawatu Turbos rugby union team and the Robertson Holden International Speedway. There are indoor venues at Arena Manawatu where netball, basketball, volleyball and Badminton are played. Other important venues include Memorial Park, Fitzherbert Park, Celaeno Park, Manawaroa/Ongley Park, Skoglund Park, Vautier Park and Massey University sports fields. # : not based in Manawatu, however, home ground when playing in Manawatu. The main hospital in Palmerston North is Palmerston North Hospital. It is the seat of the MidCentral District Health Board. There were two private hospitals, Aorangi and Southern Cross. In 2012 these two private surgical hospitals merged and are now known as Crest Hospital. The Palmerston North Municipal Electricity Department was formed in 1924 to supply the city with electricity. The Manawatu-Oroua Electric Power Board supplied the surrounding rural areas. Electricity was initially generated at the Keith Street power station until the transmission lines from Mangahao Power Station to Bunnythorpe substation were completed. The Keith Street power station continued to regularly generate electricity until the Inter-Island HVDC link was commissioned in 1965, when it was relegated to standby duty before finally being decommissioned in 1992. The Palmerston North MED and Mawawatu Oroua EPB were dissolved in the late 1990s with the government electricity sector reforms. The retail business was sold to Genesis Energy while the lines business became part of Powerco. Today, Powerco continues to operate the local distribution network, with electricity fed from two Transpower substations, at Bunnythorpe and at Linton. There is now a competitive electricity retail market, although Genesis continues to be the dominant retailer in the city. Three wind farms are located on the Ruahine and Tararua Ranges bordering Palmerston North: Te Apiti windfarm, Tararua windfarm and Te Rere Hau Wind Farm. The three farms together have a maximum output of 300 MW. Palmerston North was one of the original nine towns and cities in New Zealand to be supplied with natural gas when the Kapuni gas field entered production in 1970 and a 260 km high pressure pipeline from Kapuni south to Wellington (including a 27 km lateral pipeline from Himatangi to supply Palmerston North) was completed. The high pressure transmission pipelines supplying the city are now owned and operated by First Gas, with Powerco owning and operating the medium and low pressure distribution pipelines within the city. At the 2013 census, 40.5% of Palmerston North homes were heated wholly or partially by natural gas, the highest in New Zealand. Fibre to the premises is being deployed in Palmerston North as part of the Government's Ultra-Fast Broadband programme. As of June 2018[update], the fibre roll-out in the city is 94 percent complete, with a 42.2 percent uptake rate. State Highway 3 runs northwest–southeast from SH 1 at Sanson through central Palmerston North to SH 2 at Woodville. The section from Sanson forms the main route from the upper North Island, Taranaki and Whanganui into Palmerston North, while the section from Woodville forms the main route from the Hawke's Bay into Palmerston North. State Highway 57 runs southwest–northeast from SH 1 at Ohau, south of Levin, through the southern outskirts of Palmerston North to SH 3 east of Ashhurst. It forms the main route from Wellington to southern and eastern Palmerston North. State Highway 56 runs southwest–northeast from SH 57 at Makeura, northeast of Shannon, New Zealand, to the intersection of Pioneer Highway and Maxwells Line in the suburb of Awapuni. It forms the main route from Wellington to northern and western Palmerston North. Palmerston North is perceived as being better for cycling than most New Zealand cities, with 2001 figures putting it a close second only to Blenheim in terms of bicycle modal share. However, by 2006, cycling to work had almost halved in a decade to 5.4% and the 2013 census found that, in the central city, only 6 cycled, but 690 travelled by motor vehicle. The Manawatu River Pathway is great for family or beginners riders, as it is all flat to mildly contoured, with some limestone sections, as well as wide cement paths. The track has many access points to this trail, which runs for over 9 km between Maxwells Line in the West to Riverside Drive in the East. A new 3 km section has been added between Ashhurst and Raukawa Road, with plans to link this to the existing path over the next two years, making over 22 km of scenic tracks to explore alongside the river. Palmerston North has a fairly comprehensive 65 km on-road bicycle lane network, particularly in high traffic areas, to make it safer for people to get around the city by bike. All local buses have racks for two cycles. Criticism The cycle lane network has been criticised for a number of reasons. Motor traffic is often too fast, and there is no physical barrier between bicyclists and motorists. Most bicycle lanes in the city are marked out with parking spaces for motorist parking, making those lanes 'pointless' and raising the risk of motorists opening car doors into the path of passing bicyclists. Urban Services are coordinated by Horizons Regional Council, through Masterton-based bus company, Tranzit. Seven urban buses leave the terminal in Main Street East (in front of Palmerston North Courthouse) at least every half-hour. The buses are assigned to loop routes servicing different parts of the city. Buses are provided for students of Massey University and IPU. Daily services run to the nearby towns of Linton, Ashhurst, Feilding (via Airport), Foxton, Levin and Marton. Across the North Island Inter-regional routes are operated by Intercity and Tranzit. Intercity's routes run south (to Wellington), north (towards Auckland, via Wanganui, Rotorua and Taupo, or Napier) and east (to Masterton) from the bus terminal in The Square, Palmerston North. Palmerston North Airport is located in the suburb of Milson, on the outskirts of the city. It is approximately 5.5 kilometres (3.4 mi) from the central business district and is a regional gateway to the central North Island region. The airport has regular services to domestic destinations including Auckland, Christchurch, Hamilton, Nelson and Wellington. Flights are currently served by Air New Zealand Link, Jetstar and Originair. The airport is presently the operational base of the Massey University School of Aviation. The airport is also an freight hub for Parcelair. Until 1964, the railway ran through the city centre, with Palmerston North Railway Station in The Square. The station was moved and the track diverted 2.5 km (2 mi) to the north by the Milson Deviation in 1959–1963; work on the deviation had started in 1926. Palmerston North is an important base for tertiary institutions, the home campuses of Massey University, Universal College of Learning (UCOL) and Institute of the Pacific United (IPU) are here. A large proportion of Palmerston North's population consists of students attending these institutions or the various Papaioea Campuses of Te Wananga o Aotearoa during the student year. Palmerston North has five state secondary schools: Palmerston North Boys' High School and Queen Elizabeth College in the north, Freyberg High School in the north-east, Palmerston North Girls High School in the south, and Awatapu College in the south-west. The city also has one state-integrated Catholic secondary school, St Peter's College. Most radio stations are based outside the city, however some on the nationwide networks have studios in Palmerston North. Local radio stations include More FM (formerly "2XS") featuring the popular "Mike West in the Morning" breakfast show from 6am-10am. Sister station The Breeze also has a local breakfast show from 6am-10am hosted by Burnzee. Radio Control is the local alternative student radio station, featuring local personality Abi Symes on "The Continental Breakfast" from 7 am to 9 am. Access Manawatu 999AM is a local community station and Kia Ora FM is the local Iwi station. The city's main television and FM radio transmitter is located atop Wharite Peak, 20 km (12 mi) northeast of the city centre. The first transmitter at the site was commissioned in 1963 to relay Wellington's WNTV1 channel (now part of TVNZ 1). Grant Robertson (born 1971), Labour MP; born in Palmerston North. Current MP for Wellington Central. Joseph Nathan (1835–1912), founder of Glaxo (since merged to become the multinational GlaxoSmithKline). An Ansett New Zealand de Havilland Canada Dash 8 (ZK-NES) was also named "City of Palmerston North", staying in service until the airline's demise. ^ "Palmerston North – Heraldry of the World". Ngw.nl. Retrieved 19 June 2015. ^ "Palmam qui meruit ferat meaning". Latin-dictionary.org. Archived from the original on 19 June 2015. Retrieved 19 June 2015. ^ "Palmerston North". Palmerston North City Council. Retrieved 20 November 2016. ^ "List of Place Names – Māori Language Resources – Te Taura Whiri i te Reo Māori – Māori Language Commission". Tetaurawhiri.govt.nz. Retrieved 19 June 2015. ^ a b "PALMERSTON NORTH – Te Ara: The Encyclopedia of New Zealand". Teara.govt.nz. 11 August 1930. Retrieved 19 June 2015. ^ "NZ towns putting themselves on the map". Newshub. 5 November 2016. Retrieved 15 August 2017. ^ "New Zealand Rugby Museum | All Blacks | Palmerston North". rugbymuseum.co.nz. Retrieved 17 November 2018. ^ a b c McKinnon, Malcolm (22 April 2015). "Manawatū and Horowhenua places - Palmerston North". Te Ara: The Encyclopedia of New Zealand. Retrieved 7 November 2018. ^ "Topic: John Tiffin Stewart". Kete Horowhenua. Retrieved 4 July 2008. ^ "Our Region". Ourregion.co.nz. Retrieved 19 June 2015. ^ "All Saints' Church". Manawatu Times. XL (13536). 28 October 1916. p. 7. Retrieved 18 June 2016. ^ "1890s". Palmerston North City Council. Retrieved 4 July 2008. ^ "1910s". Palmerston North City Council. Retrieved 13 November 2012. ^ "PNCC Landscape Values and Planning Provisions:Te Mata Landscape Assessment" (PDF). Palmerston North City Council. Retrieved 4 October 2015. ^ "Mayor and Councillors". Retrieved 17 November 2018. ^ "Mayor and Councillors". Palmerston North City Council. Retrieved 3 August 2017. ^ "Tangi Utikere - Palmerston North Deputy Mayor". Retrieved 17 November 2018. ^ "Aleisha Rutherford - Palmerston North City Councillor". Retrieved 17 November 2018. ^ "Adrian Broad - Palmerston North City Councillor". Retrieved 17 November 2018. ^ "Councillors". Palmerston North City Council. Retrieved 3 August 2017. ^ "Paddy Clifford – Chief Executive". Palmerston North City Council. Retrieved 28 December 2015. ^ "Palmerston North Community Profile : For the Community Response Model Forum" (PDF). Communityresponse.org.nz. Retrieved 19 June 2015. ^ "Central Police District | New Zealand Police". Police.govt.nz. Retrieved 19 June 2015. ^ "Finding your local court – Ministry of Justice, New Zealand". Justice.govt.nz. Retrieved 19 June 2015. ^ "Infoshare; Group: Population Estimates – DPE; Table: Estimated Resident Population for Urban Areas, at 30 June (1996+) (Annual-Jun)". Statistics New Zealand. Retrieved 17 June 2015. ^ a b c d "QuickStats about a place;". Statistics New Zealand. Retrieved 16 December 2016. ^ "QuickStats about a place;". Statistics New Zealand. Retrieved 16 December 2016. ^ a b "Birthplace (detailed), for the census usually resident population count, 2001, 2006, and 2013 (RC, TA) – NZ.Stat". Statistics New Zealand. Retrieved 10 April 2017. ^ a b "2013 Census QuickStats about culture and identity – data tables". Statistics New Zealand. 15 April 2014. Archived from the original on 24 May 2014. Retrieved 25 January 2016. Note some percentages (e.g. ethnicity, language) may add to more than 100 percent as people could give multiple responses. ^ "2013 Census QuickStats about work and unpaid activities". Statistics New Zealand. 31 March 2015. Retrieved 22 May 2017. ^ "Te Aweawe, Te Peeti – Biography – Te Ara: The Encyclopedia of New Zealand". Dnzb.govt.nz. Retrieved 19 June 2015. ^ "Dugald Mackenzie Rose Garden – Palmerston North – The New Zealand Rose Society". Nzroses.org.nz. 14 January 2011. Retrieved 19 June 2015. ^ a b "Palmerston North Artists". Creativegiants.co.nz. Retrieved 19 June 2015. ^ "The Regent on Broadway – Home". Regent.co.nz. Retrieved 19 June 2015. ^ "About Us – Centrepoint Theatre". Centrepoint.co.nz. Archived from the original on 19 June 2015. Retrieved 19 June 2015. ^ "Historic power station fires up its engines in celebration". Stuff. ^ "Market share snapshot". Electricity Authority. Retrieved 5 November 2018. ^ "2013 Census QuickStats about housing – data tables". Statistics New Zealand. 18 March 2014. Archived from the original on 11 February 2016. Retrieved 13 February 2017. ^ "Broadband Deployment Update - June 2018" (PDF). MBIE. Archived from the original (PDF) on 12 November 2018. Retrieved 12 November 2018. ^ Hamilton Alternatives to Roading Study (HARTS). "Assessment of Walking and Cycling"[permanent dead link]. October 2005. Retrieved 1 September 2011. ^ "Report and Recommendations of the Cycle Investigation Working Party" (PDF). pncc.govt.nz. ^ "SNZ Commuter View". archive.stats.govt.nz. Retrieved 22 August 2018. ^ Horizons Regional Council. "Annual Report on the Implementation of the Regional Land Transport Strategy", 2009–10. September 2010. Retrieved 1 September 2011. ^ "Cycling Facilities". Palmerston North City Council. 2010. Retrieved 31 August 2011. ^ "Bus Timetable PALMERSTON NORTH URBAN" (PDF). horizons. 31 July 2017. ^ "Cyclist injured in cycle lane – Palmerston North". CAN – Cycling Advocates Network. 17 August 2008. Retrieved 31 August 2011. ^ "Helmets 'may be deterring cyclists'". Stuff.co.nz. 23 October 2008. Retrieved 29 September 2011. ^ "Airport Info". Palmerston North Airport. 2015. Archived from the original on 28 September 2015. Retrieved 3 October 2015. ^ "Route Map". Air New Zealand. 2015. Retrieved 3 October 2015. ^ "New airline Originair set to go". Stuff.co.nz. 25 June 2015. Retrieved 29 August 2015. ^ "About the school of Education". Massey University. 2015. Retrieved 3 October 2015. ^ "About us". Fieldair- Aircraft Engineering. 2015. Retrieved 3 October 2015. ^ "IPC Tertiary Institute – Home". Ipc.ac.nz. Retrieved 19 June 2015. ^ "More FM Shows". Morefm.co.nz. 14 September 2014. Retrieved 19 June 2015. ^ "Breakfast – Manawatu – Shows". Thebreeze.co.nz. 14 September 2014. Retrieved 19 June 2015. ^ "Sister cities". Palmerston North City Council. Retrieved 23 November 2014. ^ "Viscount c/n 248". Vickers Viscount Network. Retrieved 1 January 2015. ^ "Kiwi Aircraft Images". Kiwiaircraftimages.com. Retrieved 1 January 2015.